You all know how crazy I am about personalized items. In fact, the majority of my creative creations revolves around photo gifts, because I believe a picture tells a story. Pictures capture those special moments of life which you want to remember forever. 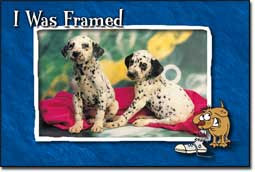 With The Framing Station software, you can embellish those precious photos with beautiful themed frames. It's as easy as three simple steps: select the photo, select the frame, and save or print. I've always been interested in creating scrapbooks, but can't afford to get into that hobby right now. So, I've considered digital scrapbooks. The Framing Station provides gorgeous frames for any occasion or event. 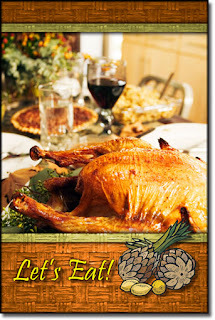 For example, this one is beautiful for framing a special Thanksgiving photo. 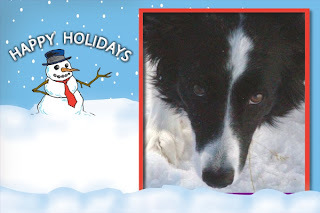 Another great idea for this software is to use it to create Christmas cards. I've always loved the cards that you receive that portrays a beautiful photo of the family. Those are cards that I hang up and keep forever. Now, I've got ideas of creating beautiful Christmas cards to send out to my family and friends. You know who would be in the photo right? Well, the dogs of course! They are my beautiful babies, after all. I thought this one was just cute beyond words. I also love their calendar frame pack, which is quite stunning. You know me, it's all about personalization and photos. They had me in mind when they created The Framing Station!